Hello Urban Sketchers of Seattle. My full artist name is Kathleen Dykzeul Keckler, maybe better known to Urban Sketchers as Kathleen Keckler or as K D Keckler on Flickr. This is my first post on the “Urban Sketchers Seattle” blog and I look forward to doing many more! I moved to Seattle from Michigan over a year ago to be closer to family. After packing and unpacking three times, I’ve finally landed and plan on staying. I have an art degree and worked in an art school at a Michigan university. For a few years I owned a frame shop/art gallery where I hosted and curated art hops. Since uprooting and moving here, Urban Sketchers has been a lifeline of friendly people, inspiring sketches and “I get to go to all the coolest places” comments from family and friends. Rather than bumbling along on my own, Urban Sketchers introduced me to Seattle sketch by sketch, learning along the way about the history and geography of the city. It’s a genius concept that suits me well. At first, aside from loving being around family, I longed for my Michigan artist friends, studio and familiar surroundings. The Urban Sketchers from the start gave me purpose, satisfied the necessity for creative outlet, challenged my skill set, introduced me to a community of artists and provided opportunity for a fresh perspective. Since starting, I filled several sketchbooks and have become fervent about carrying a sketchbook and finding time to sketch wherever I go. Seattle is a vibrant city. To this newcomer, the neighborhoods, expansive views and variety of people offer up something new to explore and think about every day. I feel lucky to have settled close to downtown because there’s always something going on. The Northwest Folklife Festival at the Seattle Center last weekend is a good example of what happens in Seattle. I went to the festival three days in a row, rain or shine. 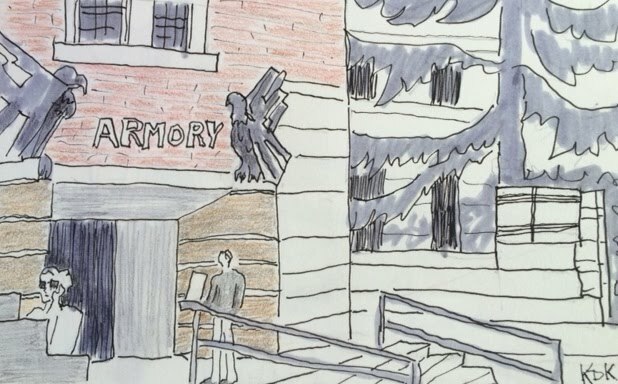 On day three, I stopped in front of the Armory to admire the concrete eagles flanking the sides of the entryway. The curved entrance below the eagles was a good stage for political activists recruiting voters to sign petitions. 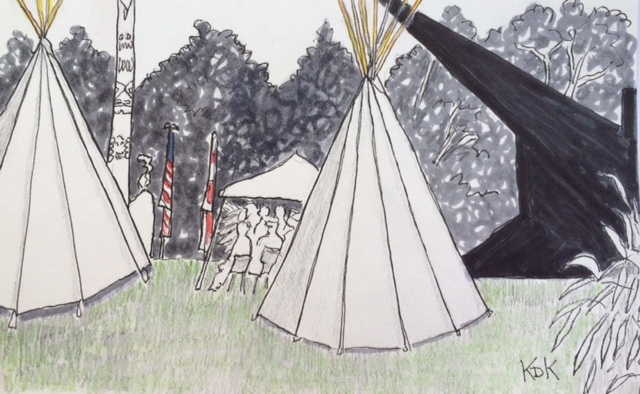 While walking out of the festival on day three, Memorial Day, my path was agreeably obstructed by two tepees and a large sculpture on the Space Needle lawn. Through the tepees, I could see children dressed in Native American costumes demonstrating tribal dances. I couldn’t have arranged a composition more compelling as the one created by the tepees, sculpture and totem pole or a soundtrack more mesmerizing than Native American drumming. I sat on a smoothly flat, dry, tree stump and sketched to the beat of the drums. In Seattle, I find reality is sometimes more inventive than fantasy. Tepees and modern sculpture look good together, something about simplicity of form. Later, I discovered the purpose of the event was to celebrate Coast Salish cultures. This is the second year I’ve been to the Folklife Festival. Both times I relied on walking through and catching acts or events serendipitously not using the extensive guide to research and plan my visit. The festival is exciting because there’s so much to see and do yet it’s frustrating if you miss out on a performance because of timing or other impediments and distractions on your journey. This year I sketched, ate a spring roll and a biscuit, visited with companions and entertained children. If there is another Folklife Festival, I promise to plan. In addition to all the things listed above, I will listen to more music and dance. Welcome as a correspondent, Kathleen! I enjoy your sketches and lively stories about them. And wow, I'm happy that you've been so inspired by USk! I echo Tina. Welcome to correspondent-dom! I also echo your thoughts about getting to know Seattle with USk. I'd been here 11 years by the time I found the group and since then I've been to places I'd never see before! I'm glad you've found a home in Seattle and with USk. Happy to seeing your story and vivid skechers. I have to say I missed this tradition Seattle festival..although lived here longer than you. As an urban sketcher, however, I will positively visiting the event.Hope see you in sketch outing soon! Welcome Kathleen! Glad you've gotten started with your first post. Seems like you're finding a great way to get to know your new home. Nice sketches. I was at folklife for a bit last Sunday as well.